Before heating and bending plastics it is a good idea to make a card template. This will help you to work out the position and sequence of the folds. It is also a good idea to practice on a scrap piece of plastic. A felt-tipped or fibre-tipped pen is used to mark the fold lines on plastics. The length of time that the plastic needs to soften depends upon two things. The colour and the thickness. It is important to turn the plastic at regular intervals. If not overheating may occur on one side and the plastic may blister. When plastic becomes soft and flexible it is ready to be bent into the required shape. If a number of identical bends need to be made in separate pieces (batch production) it is a good idea to make a bending jig or former. The use of a jig will ensure that the angle of the bend is accurate. 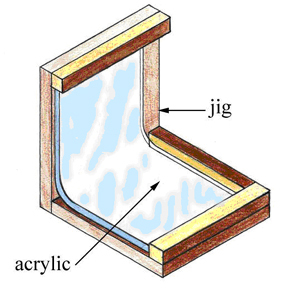 The jig also holds the acrylic in the correct position until it 'resets'. This jig bends the Perspex/acrylic at a right angle. 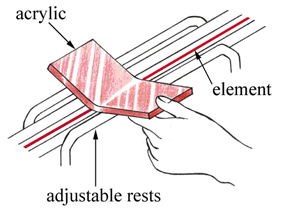 The bending jigs may be made from a combination of scrap materials.